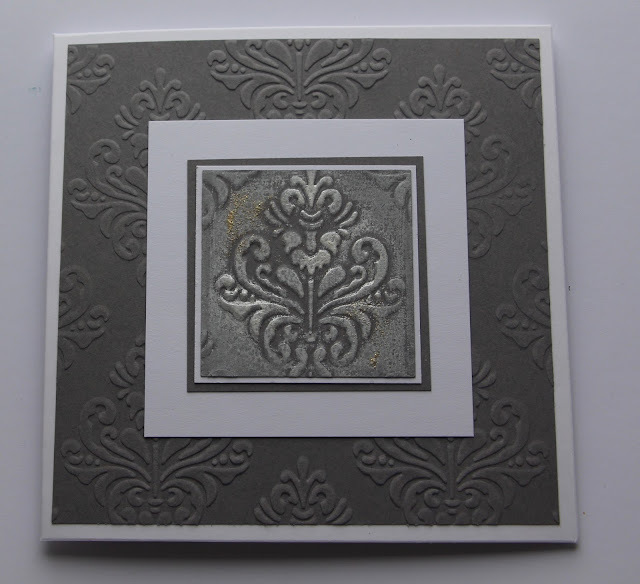 Here's a really nice and simple way to get more from your embossing folders and make a sophisticated card. I don't have many folders and rarely use them other than to add texture to a card background. It wasn't enough. I wanted more. So after some playing around with different techniques and not being happy with any of them I accidentally put my ink pad down the wrong way up on a piece of embossed card and tah day! This will make your backgrounds look old and antiques and having tried a few different colours of card found the grey and white worked really well together. If you have a white ink pad, you can do this. There is some gold embossing powder added too and in the video below the picture, I show you how to do that.